I’ve been cutting carbs for over five months and I’ve lost almost 30 pounds! My friend inspired me to try the low carb diet and she introduced me to almond flour. I didn’t know much about almond flour until this last month. Almond flour seems to be a main ingredient in many low carb recipes since it has a much lower carb content per serving than regular flour. She shared a few of her favorite recipes with me and I was hooked. Now I’m on my own path towards a healthier lifestyle. I’ve given up regular sugar, cut the sodas, and I’m drinking way more water and eating more vegetables than I ever have. I’m happy to know that I can eat yummy desserts like this and still lose weight and stay satisfied during this new low carb lifestyle. I even have my girls help me in the kitchen. They love to help mommy bake! 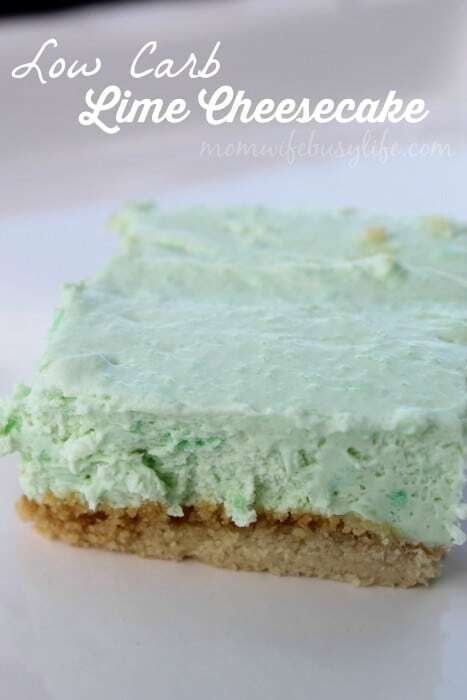 This low carb Lime Cheesecake is perfect to have on hand during the summer. I can compare it to a Key Lime Pie! It’s very light, fluffy, and creamy and has the perfect amount of sweetness to it. Spray an even coat of olive oil spray into an 8X8 inch baking dish. Set aside. In a medium size mixing bowl, mix together the almond flour, butter, and stevia. Mixture will be crumbly. Pour the mixture into the baking dish and press down firmly until an even layer is formed at the bottom of the baking dish. Using a medium size mixing bowl, mix cream cheese, vanilla extract, heavy cream, and lime Jello mix together well with an electric mixer on high until creamy. Pour mixture on top of the crust and spread evenly with a spatula. Cover and place in the refrigerator. Allow the lime cheesecake to chill for a few hours before serving. Makes 9-12 servings. Like this recipe? Find more great recipes here! Good flavors in this. I haven’t tried almond flour before.